TORONTO — John Tavares spent a lot of Saturday walking the length of his pool — back and forth, back and forth — trying to make what felt like an impossible decision. He could stay with the New York Islanders, the team that drafted him, the one where he had spent his entire professional career. Or the star centre could join the Toronto Maple Leafs, the franchise he dreamed of playing for as a child. In the end, the pull of home was too strong. After one of the most-watched courtships in NHL history, Tavares signed a contract worth US$77 million over seven years with the Leafs an hour after free agency opened Sunday, bringing an end to a saga that gripped hockey for the better part of a week. Tavares, who was born in the Toronto suburb of Mississauga and grew up a little further west in Oakville, tweeted he would be joining the team just after 1 p.m. ET before adding photo of himself sleeping on Maple Leafs sheets from his youth with the caption: "Not everyday you can live a childhood dream." That dream had just become reality, but it wasn't an easy choice. 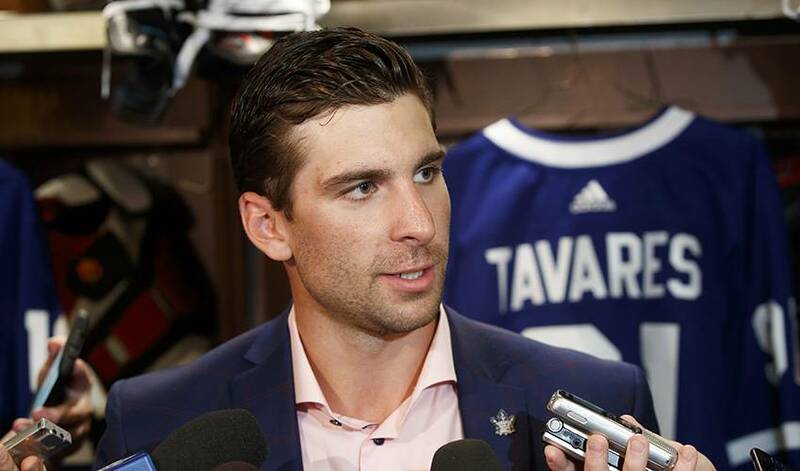 "My heart was in two places — where I'm from and a place where I've been for a long time," Tavares said at his introductory press conference a few hours later. "My gut was tearing apart, my heart was tearing apart trying to figure out what I wanted to do. "(Saturday) was one heck of a day." Tavares said he remembers watching Leafs games with his father on the couch as a three year old, including Doug Gilmour's overtime goal against St. Louis in the 1993 playoffs, and thought about one day pulling the jersey on for real when he used to play outdoor hockey with his friends. "I just had this feeling this was the right fit for me," Tavares said. "It was an opportunity ... it was once-in-a-lifetime. "I'm just like, 'Why don't you just go out there an grab it, take your best shot at it.'" Tavares, who leaves the Islanders after nine seasons, met with his now-former club, the Leafs, San Jose Sharks, Boston Bruins, Tampa Bay Lightning and Dallas Stars over a three-day stretch from last Monday to Wednesday as the six franchises on his preferred list made pitches for the 27-year-old's services. Tavares had until 12 a.m. ET on Sunday to ink a contract extension that included an eighth season with the Islanders. But after that deadline passed, it seemed certain New York was out of the running with only seven-year terms available. In truth, Tavares made his decision by late Saturday afternoon. "As time goes on you start to get a feeling where your heart is and what your gut's telling you," he said. "My instincts were telling me this is the right thing for me." The end result is Leafs rookie general manager Kyle Dubas getting by far the most prized free agent on the market, two summers removed from the franchise missing out on Steven Stamkos when the Lightning centre and native of Markham, Ont., decided to stick with Tampa Bay. Tavares coming to Toronto is the biggest free-agent splash in Leafs' history — eclipsing the dual additions of forwards Gary Roberts and Shayne Corson in 2000 — and the biggest in the league since defenceman Scott Niedermayer bolted New Jersey for Anaheim in 2005. Quite frankly, star players in their prime rarely change teams in this fashion. "Everything happens very quickly," Tavares said. "The emotions are very strong, very heavy. "It was quite the process." The first pick in the 2009 draft, Tavares has the fifth-most goals (272) and ninth-most points (621) in 669 games since entering the league. He had 37 goals and 47 assists in 82 games for New York last season. While the deal is an earth-shaking coup for the Leafs, it also doesn't come cheap and could present a cap squeeze in the near future with young stars Auston Matthews, Mitch Marner and William Nylander — a restricted free agent as of Sunday — all due big raises. But Tavares said a number of his now-teammates reached out over the last week, including Matthews and Marner, to convince him to join them in Toronto. "This opportunity was just so rare," Tavares said. "There's a big window here to win and be a part of something special." The club now owns an impressive 1-2-3 punch down the middle with Matthews, Tavares and Nazem Kadri, and solid goaltending in the person of Frederik Andersen, but while the Leafs still probably need help on defence, they're a lot closer to a Stanley Cup than they were Saturday. "They're driven to win," Tavares said. "They're hungry kids." Matthews and Kadri both welcomed Tavares via Twitter shortly after the deal was announced. Kadri added a follow-up tweet featuring a picture of himself and Tavares sitting on the bench together from their junior days. "We were very hopeful," Dubas said of trying to woo the biggest free-agent fish. "We thought we made a very good case. "The most important part was presenting the players that John was going to play with and in the end I think that's why, if you boil it down, players want to come to different places." Toronto made the playoffs the last two seasons after making it once in the previous 11 campaigns, but lost in the first round both times. The Leafs waved goodbye Sunday to forwards James van Riemsdyk, Tyler Bozak and Leo Komarov, as well as defenceman Roman Polak, after each signed elsewhere, but that news hardly made a ripple compared to the arrival of Tavares. While getting Tavares is a massive win both on and off the ice for Toronto, it's a disaster for New York. The Islanders hired former Leafs general manager Lou Lamoriello in May to be their GM before adding Barry Trotz — less than two weeks removed from winning the Cup with Washington — as head coach with an eye towards keeping their captain. It turned out in the end to not be enough. "That place means a lot to me," Tavares, high voice cracking slightly, said of New York. "Everything I've been through there, the impact people had on me, the things we went through as a group ... it was such a hard decision because of just really how special it was." Now his attention turns to trying to help Toronto win a Cup, something that fans haven't experienced since 1967. "People have been waiting for that for a long time, people are hungry for it," Tavares said. "The passion for the game, the passion for their Maple Leafs is unprecedented." And it's that passion that ultimately led him home.